Sealants, glazes, waxes, and even coatings - in the world of car care right now there are a number of options when it comes to protection and enhancement of your vehicles exterior. But what should you be using? While there is no right answer for everyone, there certainly is a right choice for you depending on how your vehicles are used, stored, and ultimately what your goals are for the finish. DURABILITY = how long the product lasts and how well it protects the underlying clearcoat. AESTHETICS = the visual impact the product provides in terms of added gloss, depth, etc. Glazes are probably the least understood product considered a part of the LSP category. The term glaze has been used and misused widely over the years by a number of manufactures, but most professionals have come to accept that a glaze is most commonly a non-abrasive product used to mask imperfections and provide aesthetic enhancement. Most glazes will be a blend of a few basic ingredients - wax, solvent, and oils. These three components are blended in a ratio to allow them to help fill in minor imperfections and thanks to the solvent content even offer a level of paint cleansing. 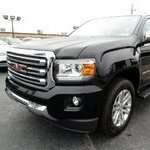 Glaze has long been a favorite product of car lots all over the world since they offer fast, easy, and inexpensive enhancement of painted surfaces in one step. However, the short lived effects have left more than a few new car owners wondering why their recent purchase looked so awful after just a few washes. Ultimately glazes are best suited as a compliment to another LSP or used only for short term enhancement. The blends rarely lend themselves to more than a week of staying power in mild conditions and they're often easily washed away or evaporate when exposed to moderate heat. In spite their short lifespan on your vehicles finish a glaze can offer fast, easy, and dramatic enhancement of gloss and depth making them a great choice as a topper right before a show, cruise, or whenever you want a little extra 'pop' on your finish. Wax is actually comprised of naturally occurring compounds, harvested from a specific type of palm tree, commonly known as the detailing world as Carnauba wax. Carnauba wax comes in a variety of grades, purities, and can be refined to various levels. Its blended with oils, other wax types (like bees wax), and in some cases even some polymers to create car wax. Carnauba is actually a hard and coarse substance that has to be blended to create a chemical suitable for application to a vehicle - so be skeptical of any product claiming to be 100% carnauba. The makeup of carnauba would make it almost impossible to spread over your paint if it isn't cut with various other ingredients. 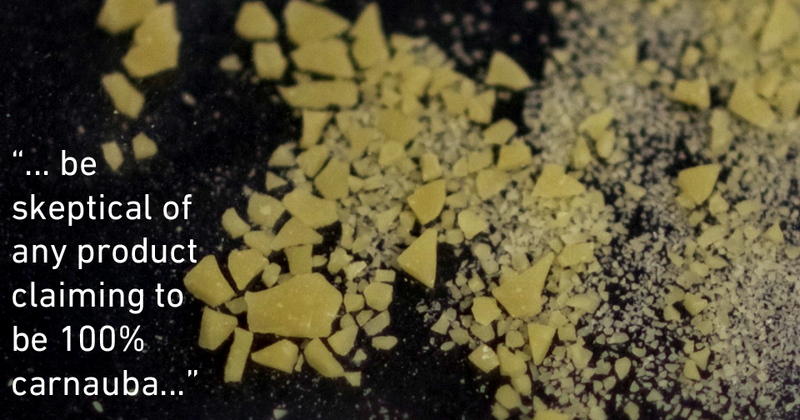 See the magnified picture of raw carnauba wax below for a better idea why no car wax can be truly 100% carnauba. Blending various waxes, solvents, oils and polymers together can give you virtually an infinite number of combinations and types of car wax, but there are some limitations no matter how good the blend. These limitations center mostly on how susceptible to deterioration from heat, detergents, and abrasion wax is. Even the best grades of carnauba will have a melting point between 160-180 degrees F, meaning a black car parked outside on a summer day in a climate like Arizona will easily begin to see evaporation of wax coating, within just a few days, or even a few hours the wax will be completely gone. Additionally, waxes will offer lower resistance to harsh detergents, like those found in touchless car washes. The biggest benefit to waxes is their overall enhancement to painted finishes. A good wax will enhance colors, fill minor imperfections, and produce a rich, deep look that typically won't be seen with other LSP options. On dark colors (blacks and blues) you'll see additional depth and dimension. On brighter colors (yellows and reds) you may notice a more rich, vibrant look. Sealants tend to be mostly synthetic man made products chemically engineered to do very specific things, but mostly they excel at providing durable protection. Because these products are essentially created in a lab they can be modified, customized, and engineered to meet any number of criteria and perform in different ways. 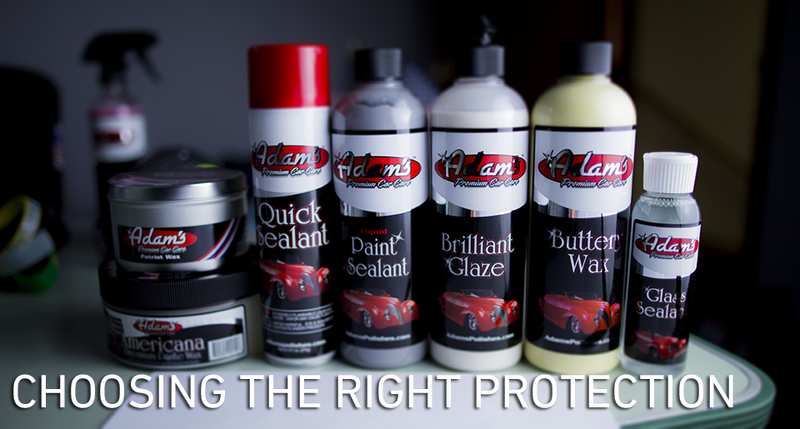 On average a sealant will provide better durability than a comparable wax product. With much higher resistance to heat, UV, and detergents an application will withstand more abuse. Sealants encompass a wide variety of chemical compounds including acrylic resins, polymers, and aminos. Some will include varying amounts of wax in their blend to aid in filling or adding gloss. For years sealants fell behind waxes in terms of providing aesthetic enhancement, but more recently sealants have been bridging that gap, offering better durability and an ever increasing levels of gloss and depth. While a sealant hasn't quite been able to recreate the rich depth found from carnauba based products the gap separating the two is increasingly smaller. Most sealants currently on the market offer excellent clarity and reflective properties making their look ideal for colors that don't typically benefit from waxes like metallic silvers and white. The most recent technology for exterior protection is found in the coatings category. Once a product only for professionals the detailing world has begun to see more consumer friendly products that offer previously unheard of longevity and various other benefits. Described as nano coatings, glass coatings, or ceramic coatings the chemicals used in this category offer durability spanning multiple YEARS rather than months with some even claiming permanent protection. Coatings can almost be thought of as a clear coat for your clear coat. They form a hard, clear, cured, hydrophobic barrier that is more resistant to scratches than automotive clear coat and even prevents contamination from sticking making them easier to clean. The products in this category continue to evolve offering an increasingly diversified amount of benefits, with some coatings being easier to apply, others offering better scratch resistance, and others even focusing on some amount of gloss enhancement like a wax. The coating market is still very young and continues to evolve. It should be mentioned that there is some level of skill involved in a coating application as well. A finish should be completely corrected prior to a coating application simply because any defects still in the paint will be trapped beneath the coating. Additionally coatings have specific cure times and techniques - be sure to research the application and requirements for any coating before attempting to apply yourself. SO WHICH ONE SHOULD YOU BE USING? There are no specific rules for choosing a product to use on your particular car, but there are some clear frontrunners to choose from simply by looking at how you use/store your vehicles mixed with your overall desire for increased shine. For outright show car looks its hard to beat a wax. Its ideal for a car that spends most of its days in the garage or lives in more mild climates. A wax still continues to be the ultimate choice for someone looking to get the most 'shine' out of their finish. While sealants and coatings continue to find new levels of shine they still don't quite measure up to the look of a quality carnauba paste wax. On the other hand a sealant or even a coating might make sense for your car if its a daily driver or its exposed to extreme winters or very hot summers. If you're among the large percentage of people who have to drive their car every day, even when the weather is less than perfect durability and ease of maintenance are your primary concerns. Ultimately you want to keep your car protected from the elements - so for a driver or car stored outside explore the options of sealants and coatings. Ultimately, the choice of what is best is up to you. Find a product or products that have the right mix of the durability and enhancement for your budget and your free time. Afterall, if you just enjoy the process of cleaning and waxing your car then a wax is going to give you the most excuses to rub on it. 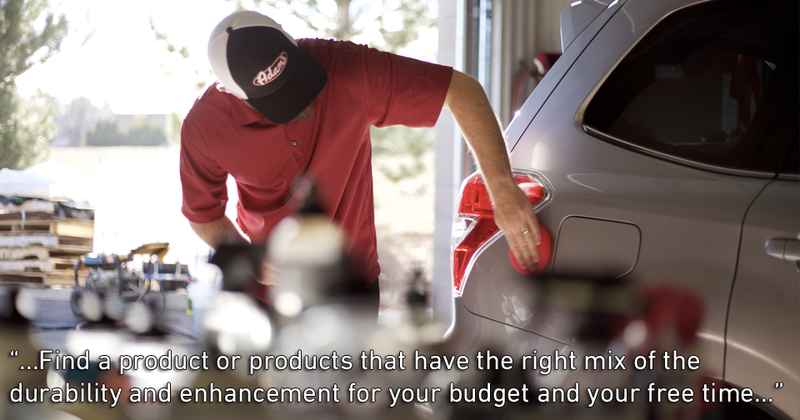 Theres no rule you can't apply a wax to your daily driver or a sealant to your garage queen, but understand that you might not be seeing the full benefit of your product choice if its not ideal for the conditions its exposed to. What if you want the best of both worlds? Well, you could venture into the world of layering. Working with a couple of product types in specific layers can give you a number of benefits, so long as you apply them properly. As a general rule, the most durable product should always be used as the base, so for example if you were working with a sealant and a wax, the sealant would be your base layer that is then topped with the wax. The only exception to this rule comes into play with a combination of glazes and wax. Because wax doesn't bond to the paint in the same manner as a sealant or a coating a glaze can be used UNDER a wax to maximize the filling ability of the glaze without compromising the longevity of the wax coat. The flip side of layering different products is in the top coat performance. Remember that whatever is applied last will be what outward behavior you see most. So when you top a coating with wax you will notice the aesthetic benefit, but you might also notice that the surface isn't as hydrophobic as it would've been with just the coating alone. The best thing to do is to experiment for yourself to see what you like. With so many possible combinations theres going to be a process that suits you best, finding it is just a matter of trying them and evaluating for yourself. If some is good, more must be better? Right? That might not always be the case. Many products will stack a few layers deep for additional surface coating, but there is a point of diminishing return. A wax for example will max out at about 2 thin coats, attempting to put 5 coats of a wax down in search of extra gloss and super durability just doesn't work. The additional coats simply begin to smear the base coats around and can actually have a negative impact on the clarity of the finish. The same is true of glazes for the mostpart. Sealants, while more apt to layer without issues, still only stack a few layers deep before they begin to offer no additional benefit and you begin wasting product. Our independent testing showed no noticable benefit for a panel treated with 2 coats of sealant vs a panel treated with 4 coats. With coatings, the tricky part of their curing process and the specific type of coating. Some coatings require substantial cure time before an additional layer can be applied, others require additional layers be applied before the first is fully cured to bond properly as the cured coat will actually repel the 2nd coat. Refer to your specific coating technology for guidance if you intend to layer. In the case of layering sealant then glaze then wax, will the extra solvents in the glaze degrade the underlying coat of sealant, if the sealant has been left to cure an hour before applying the glaze? That's perfect DVK! This should answer a lot of questions for the newcomers like myself. Holy great article! Should write books and what not! Correct me if I'm wrong, but Junkman used to preach that the wax protects the paint, but it is the polishing that produces the shine. Is this correct? Pretty excited for the coatings to be offered. Sounds like they have a lot of potential! Polishing produces the bulk of the shine, correct. You can't make paint shine without polishing but an LSP is going to enhance what's there to one degree or another in addition to providing protection. The solvent content is extremely weak... It's used to keep the wax content finely dissolved. It lacks the power to do much to a good sealant. The impact would be minimal. Excellent write up. Very informative !! Perfect write-up! Thanks for the info Dylan, very informative. By the way, do you guys still have those hats that are in the picture above? Would love to have one. Excellent write up. Answered a lot of my questions about using sealants. I should probably switch to a sealant - all these years of waxing and I still don't know karate! If layering product, does the lack of durability of BG effect the durabilty of the wax that it is topped with? No, and thats mainly b/c wax more rides along on the vehicles surface that it bonds, and after the solvents evaporate out of the glaze whats left behind is mostly wax and oils, components already in wax. There can be some loss in durability of a glaze is used under a sealant b/c the glaze inhibits the sealants ability to grab onto the surface and with coatings you must start with a clean surface to get proper adhesion so glazes are never used before coatings. Thank you sir! So glad you're back! Been missin ya and this write up is right on time as I just got some patriot wax and have been considering (after polishing my ZL1) layering sealant, glaze then patriot. I think it will give the "blue ray metallic" paint (dark blue) a nice depth of shine. What do you think? The sealant and then glaze gives an awesome finish....thought I might try to improve on near perfection! Thanks Dylan! This is GREAT info!